Apparatus of Willard L.V. Pollard – FOP Shvachko V. V.
The Position-controlling apparatus is device for controlling the movement and positioning of a spray gun for controlling it in its movement with respect to curved or irregular surfaces to be coated, such as an automobile body or the like. This apparatus was designed by American inventor Willard L.V. Pollard – the appropriate patent (US Patent No. 2,286,571) was granted in 1942 (filled in 1938). This apparatus comprises a spray gun for spraying a liquid coating onto an automobile body or the like, which body is mounted on a traveling conveyor, a conduit for supplying paint or the like to the spray gun, and means 5 electric motors for controlling the movement and positioning of the spray gun with respect to the surface to be sprayed. The movement controlling and positioning apparatus comprises three primary arms, each mounted to oscillate about a fixed axis, electric motors for controlling the oscillating movement of these primary arms, respectively, and three secondary arms, each having a universal joint connection at one end with an end of one of the primary arms and each secondary arm being connected with a spray gun supporting head. Important object of the Position-controlling apparatus is to provide positioning device which will require a relatively small amount of power for operation and in which a wide range of positioning movement is possible. This apparatus was claimed as the first spatial industrial parallel robot. 1. 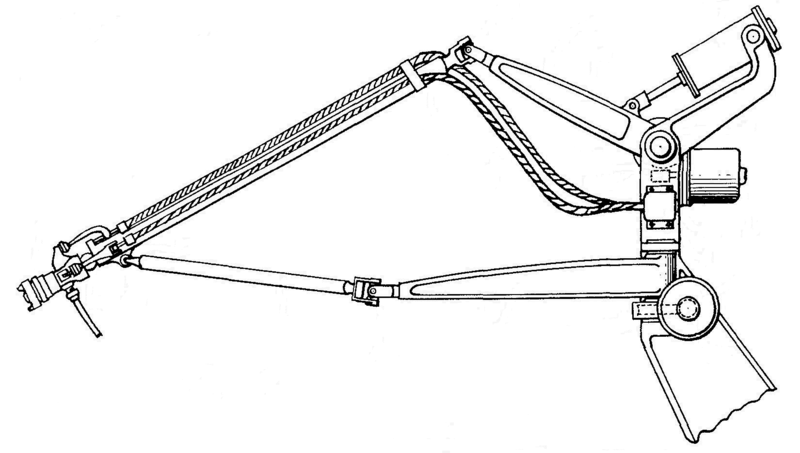 Position-controlling apparatus. – Mode of access: http://www.google.com.ua/patents/US2286571. 2. Parallel manipulator. – Mode of access: http://en.wikipedia.org/wiki/Parallel_robot. 3. Parallel Robots, Hexapods, Stewart platforms // ParalleMIC. – Mode of access: http://www.parallemic.org/. 4. Industrial robot. – Mode of access: http://en.wikipedia.org/wiki/Industrial_robot. 5. Промисловий робот. – Mode of access: http://uk.wikipedia.org/wiki/%D0%9F%D1%80%D0%BE%D0%BC%D0%B8%D1%81%D0%BB%D0%BE%D0%B2%D0%B8%D0%B9_%D1%80%D0%BE%D0%B1%D0%BE%D1%82. 6. Промышленный робот. – Mode of access: http://ru.wikipedia.org/wiki/%D0%9F%D1%80%D0%BE%D0%BC%D1%8B%D1%88%D0%BB%D0%B5%D0%BD%D0%BD%D1%8B%D0%B9_%D1%80%D0%BE%D0%B1%D0%BE%D1%82. 7. Modeling, Performance Analysis and Control of Robot Manipulators / ed. Etienne Dombre, Wisama Khalil. – London, Newport Beach : ISTE Ltd, 2007. – 400 p.
8. Dan Zhang Parallel Robotic Machine Tools / Dan Zhang. – New York, Dordrecht, Heidelberg, London : Springer, 2009. – 220 p.
9. Grigore Gogu Structural Synthesis of Parallel Robots : 3 parts / Grigore Gogu. – Dordrecht : Springer, 2008. – Part 1 : Methodology. – 710 p. – Part 2 : Translational Topologies with Two and Three Degrees of Freedom. – 765 p. – Part 3 : Topologies with Planar Motion of the Moving Platform. – 690 p.
10. Parallel Manipulators, Towards New Applications / ed. Huapeng Wu. – Vienna : I-Tech Education and Publishing, 2008. – 510 p.
11. Parallel Manipulators, New Developments / ed. Jee-Hwan Ryu. – Vienna : I-Tech Education and Publishing, 2008. – 500 p.
12. Merlet J.-P. Parallel Robots / J.-P. Merlet. – [2nd ed.]. – Sophia-Antipolis : Springer, 2006. – 400 p.